What Collar is Right for Your German Shepherd? Home / News / What Collar is Right for Your German Shepherd? 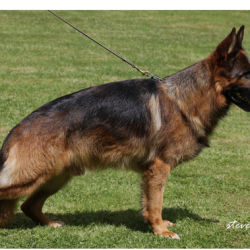 The Best breeders of German shepherds in Toronto and Ontario agree that there is no dog training collar that is right for every dog. Every dog is different, and every owner is different. 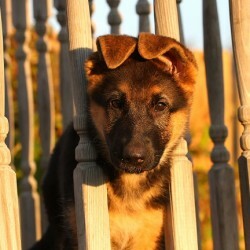 What works for my German shepherd puppy is not necessarily going to work for your GSD dog. Shock collars, choke collars, pinch collars, buckle collars, Gentle Leaders, Haltis, anti-pull harnesses and martingale collars all work well for certain dogs. The Gentle Leader is marketed as a gentle option to be worn over a dog’s muzzle, similar to a horse halter and is supposed to prevent pulling because the dog handler controls the dog’s head. This is a good tool to use when I am intended to walk me dog. With some dogs, owners can just slap a head collar on and the dog suddenly walks nicely on leash, including around distractions that the dog would have barked and lunged at in the past. The Gentle Leader stops a dog from getting excited, panting, making “choking” sounds and causing other dogs to get very agitated as well. Head halters are tools designed to help you control your dog by guiding its head. An animal tends to go where its head goes. So, if the dog wants to pull on the leash and its head can’t move, it can’t pull you so well. If the dog wants to head in one direction and you want to go in another, gently (but not daintily) guide its head in the direction you want to lead the animal. Because of the neck strength of dogs, few cases of injury due to head collars have been proven or medically documented. However, veterinary documented injuries caused or exacerbated by choke chain corrections and electronic collars are easy to find. Pair the head collar with food and systematically train the dog to stick its head further and further through over several sessions if your dog dislikes wearing something on his head. Because the owners are able to guide the head, they can more easily get their dogs’ attention. The use of a head collar can greatly speed up the process of training dogs to focus on their owners and even help control anxious dogs so that they can calm down enough to focus and take treats. Dogs learn not to pull only as long as they are wearing the tool, but as soon as you remove the Gentle Leader, they go right back to pulling. This defeats the purpose of a dog training tool. Your ultimate goal is of course to achieve reliable obedience with no leash. And some dogs really put up a protest, pawing at their nose and rubbing their face on the ground in an attempt to get the Gentle Leader off. The best thing to do is just ignore this behavior and continue on with the walk, but it’s not always easy to deal with a bucking, rearing, 80-pound dog. Most dogs do not have any issues with a pinch collar, but a lot of dogs do not like having something over their nose. Many dogs shut down, cower and put their tail between their legs at the sight of their Gentle Leader. Even though the dog knows we go for a walk every time you put on the Gentle Leader, the do will still avoids you every time you get it out. A pinch (prong) collar is usually made out of metal and has prongs distributed evenly around the collar. It should be worn high on the dog’s neck, right under his chin and behind his ears. When the dog pulls, the owner gives a slight “correction” by pulling up or to the side. The pinch collar allows you to give the dog a correction. 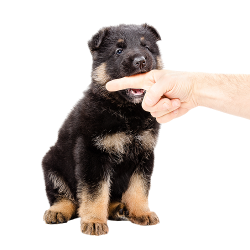 There is not only a “positive reinforcement only” approach to dog training. Dogs growl and bite and pin one another all the time. If your dog is focused on a smell or another dog during a walk, all he needs is a quick tug on the leash to re-direct his attention. The pinch collar fits around a dog’s neck like a normal, nylon collar that will allow the dog to transition the dog from the pinch collar to a nylon collar. The pinch collar is designed to be worn high on the dog’s neck, right behind the ears and under the chin. If the pinch collar is worn on the thickest part of the dog’s neck, it will be too easy to pull. 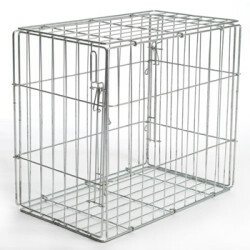 The pinch collar should be used as a tool to prevent pulling, not to make the pulling more comfortable for the human. Some dogs are so sensitive that any correction scares them. Some dogs react aggressively by biting the leash due to a low-frustration tolerance.